NASA said Sunday it is postponing the launch of its CALIPSO and Cloudsat missions until Tuesday - the third straight day the space agency has delayed the liftoff. This time, a NASA official said, there was a problem with the refueling aircraft for the radar plane assigned to track the Boeing Delta II launch vehicle’s trajectory. Mission controllers have rescheduled the launch for 3:02 a.m., Eastern Time, on Tuesday from Vandenberg’s Space Launch Complex 2. CALIPSO and CloudSat are designed to provide a three-dimensional perspective on Earth's clouds and aerosols, and to study how clouds and the airborne particles form, evolve and affect water supply, climate, weather and air quality. CloudSat's cloud-profiling radar is more than 1,000 times more sensitive than typical weather radar. It can detect clouds and distinguish between cloud particles and precipitation. "The new information from CloudSat will answer basic questions about how rain and snow are produced by clouds, how rain and snow are distributed worldwide and how clouds affect the Earth's climate," said Graeme Stephens, CloudSat’s principal investigator at Colorado State University in Fort Collins. CALIPSO - which stands for Cloud-Aerosol Lidar and Infrared Pathfinder Satellite Observation - carries an instrument that can detect aerosol particles and can distinguish between aerosol and cloud particles. 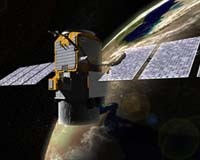 "With the high resolution observation that CALIPSO will provide, we will get a better understanding of aerosol transport and how our climate system works," said David Winker, the mission’s principal investigator at NASA's Langley Research Center in Hampton, Va.
Mission plans call for the satellites to be launched into a 705-kilometer (438-mile) circular, Sun-synchronous polar orbit, where they will fly in formation just 15 seconds apart as members of NASA's A-Train constellation, which includes three other Earth Observing System satellites. A-Train includes NASA’s Aqua and Aura satellites and France's Polarization and Anisotropy of Reflectances for Atmospheric Sciences coupled with observations from a Lidar satellite. Mission managers think the data from CloudSat, CALIPSO and the other A-Train satellites will be much more useful when combined. Their measurements should improve insights into the global distribution and evolution of clouds, and lead to better weather forecasting and climate prediction. An Atlas V launcher successfully carried the ASTRA 1KR satellite into orbit today, on the third mission of the year for International Launch Services (ILS). The 19-story Atlas V-411 vehicle lifted off today from Cape Canaveral's Launch Complex 41 at 4:27 p.m. EDT (20:47 GMT).